The highest court in the Central African Republic has labeled as unconstitutional a transitional parliament decision to bar thousands of refugees outside the country from voting in upcoming elections, and overturned it. The court ruling came just over a week after the United Nations Refugee Agency (UNHCR) condemned the parliament’s decision. The United Nations estimates that there are over 450,000 mostly Muslim refugees who have since 2013 fled a civil war which often took religious dimensions. In March, two reports from the UN and US outlined the systematic destruction of 417 of the country’s 436 mosques as sectarian fighting continued despite a large EU and African Union peacekeeping force. The elections – slated for October 18 (first round) and November 22 (second round) – are designed to put in place a political process that will ensure a democratic government comes to power with the mandate to secure and stabilize the war-torn country. A referendum on the constitution is to be held on October 4. The current voter registration period ends on July 27 but may be extended to account for the challenges faced by refugees in neighboring countries. 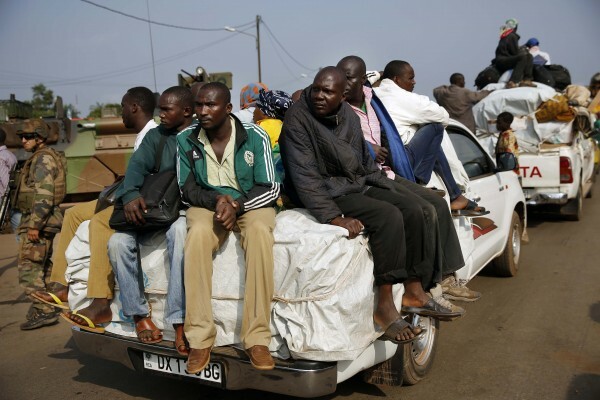 The current crisis in CAR – a mineral rich nation of 4.6 million people – began when Seleka – a rebel amalgamation of several different factions – started moving toward the capital Bangui in March 2012, hoping to remove Francois Bozize, a military officer who seized power in 2003 and had been elected president twice since then. The largely Muslim rebel group Seleka seized control of the Christian-majority country in the aftermath, and in some instances attacked and killed Christian civilians. Early in January 2014, the country’s National Assembly selected Catherine Samba-Panza to be the next president replacing Michel Djotodia – a Muslim, and former Seleka comander – who fled the capital Bangui to Benin in early 2014. His departure was marked by the increase of Christian militia attacks against Muslim citizens, claiming to be avenging crimes committed by the Seleka rebel militias in 2013. In October 2014, the UN said that the capital Bangui had been almost entirely purged of its Muslim population.